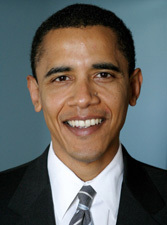 OBAMA, Barack, a Senator from Illinois and 44th President of the United States; born in Honolulu, Hawaii, August 4, 1961; obtained early education in Jakarta, Indonesia, and Hawaii; continued education at Occidental College, Los Angeles, Calif.; received a B.A. in 1983 from Columbia University, New York City; worked as a community organizer in Chicago, Ill.; studied law at Harvard University, where he became the first African American president of the Harvard Law Review, and received J.D. in 1991; lecturer on constitutional law, University of Chicago; member, Illinois State senate 1997-2004; elected as a Democrat to the U.S. Senate in 2004, and served from January 3, 2005, to November 16, 2008, when he resigned from office, having been elected president; elected as the 44th President of the United States on November 4, 2008, and was inaugurated on January 20, 2009; reelected in 2012 and served until January 20, 2017. Office of History and Preservation, Office of the Clerk, Black Americans in Congress, 1870–2007. Washington, D.C.: U.S. Government Printing Office, 2008; Obama, Barack. Dreams From My Father: A Story of Race and Inheritance. New York: Times Books, 1995. Reprint 2004; Obama, Barack. The Audacity of Hope: Thoughts on Reclaiming the American Dream. New York: Crown Publishers, 2006.